Size of the INDUSTRY During the year 2008-09, the cotton exports from the country reached at US$ 850 million including 35 lakh bales. Market Capitalization It contributes about 14% to the industrial production, 4% to the GDP and 14.42% to the country's export earnings. Indian Cotton Industry's history of establishment has a rich past. English did gradual inaugurations of a number of beneficial industries in India and the country was opening its eyes to a whole new era of mechanisation. With 19th century India had successfully established major production industries, owing to the initiative of the British East India Company. Cotton was an essential staple fabric, which was needed in almost every work of life in India. Indian Cotton Industry was the precise industry which fostered a humble beginning, attracting budding Indian industrialists. In 1854 towards making that dream into a reality, James Landon established the Broach Cotton Mill, the first successful cotton mill in Bombay. The first steam-driven cotton mill also went into production in 1856. 79 cotton mills were in operation by 1883, as Bombay took the industrial lead. Establishment of cotton industry was thus an initiation of a new history. The first mechanized jute mill began operations in Bengal in 1855. Government of India in October 1861 issued a waste lands order for the purpose of encouraging the growth of cotton. Hugh Mason, Chairman of the Board of the Manchester Cotton Company in 1862, sought the impeachment of Sir Charles Wood (1800-1885), Secretary of State for India. Mason felt the Government of India was holding to a do-nothing policy regarding the provision of greater supplies of raw cotton to Manchester`s manufacturers. The Lancashire Cotton Industry had emerged sufficient pressure on the Secretary of State for India to have the Government of India place a 5% tariff on Indian cotton manufactures in order to allow British cotton goods to be more marketable in India. 64 jute mills existed in Bengal, with 36,000 looms employing a total of 225,000 workers in 1913. Cotton is one of the principal crops of India and is the major raw material for domestic textile industry. The Indian Cotton Industry provides sustenance to million of farmers as also the workers involved right from processing to trading of cotton. The Indian textile industry consumes a diverse range of fibres and yarn, but is predominantly cotton based. The ratio of cotton to manmade fibres and filament yarns by the domestic industry is about 56:46. 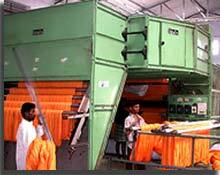 Indian Cotton Industry has an overwhelming presence in the economic life of the country. Apart from providing one of the basic necessities of life, the Cotton industry also plays a pivotal role through its contribution to industrial output, employment generation and the export earnings of the country. It contributes about 14% to the industrial production, 4% to the GDP and 14.42% to the country's export earnings. India is the only country which grows all four species of cultivated cotton starting from Gossypium arboreum and herbaceum (Asian cotton), G.barbadense (Egyptian cotton) and G.hirsutum (American Upland cotton). Gossypium hirsutum represents 90% of the hybrid Indian cotton production and all the current BT cotton hybrids are G.hirsutuim. India produces large number of cotton varieties and hybrids. Though the number of varieties in cultivation exceeds 75, 98% of the production is contributed by about 25 varieties only. Indian Cotton is produced in country in three zones viz., Northern zone comprising the States of Punjab, Haryana and Rajasthan & Central zone comprising the States of Maharashtra, Madhya Pradesh and Gujarat and Southern zone comprising the States of Andhra Pradesh, Karnataka and Tamil Nadu. Cotton cultivation has gained momentum in the eastern State of Odisha, besides these there are nine States also. In the year 2008-09 during cotton season the country once again harvested higher cotton production for the fifth consecutive year at 4.93 million metric tons (equivalent to 29.0 million bales of 170 kgs each). In the last two decades, the production of cotton has gone up from 7.5 million bales in 1983-84 to 16.3 million bales of 170 kg/bale during 1998-99. Government decision to permit the export of 85 lakh bales as against the earmarked quantity of 55 lakh bales by Cotton Advisory Board at the beginning of cotton season (Oct-Sept) has brought down the closing stock to around 38.5 lakh bales, making to stock to use ratio at 15%. Whenever the stock to use ratio was dipped below 20 %, the cotton prices have increased abnormally the recent notification notification had resulted in jacking up the prices of cotton almost rs.4000 per candy of 355 kg within a month. As a part of measures to boost cotton trade, the Government of India had liberalized raw cotton exports since July 2001, dispensing with the system of allocation of cotton export quota in favour of different agencies and traders. 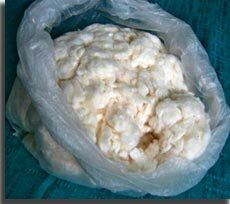 Exports of cotton from the country are under Open General Licence (OGL) since July 2001. During the year 2008-09, the cotton exports from the country reached at US$ 850 million including 35 lakh bales. As the largest private enterprise in India is having more than 100 million farm holdings, agriculture supports more than 60% of the population, contributes nearly 19% to India's Gross Domestic Product (GDP) and 11% to the total exports. Around 51% of the geographical area in India is already under cultivation as compared to 11% of the world average. Government of India as a part of measures to boost cotton trade had liberalized raw cotton exports since July 2001, dispensing with the system of allocation of cotton export quota in favour of different agencies and traders. Exports of cotton has been done under Open General Licence (OGL) since July 2001. During the year 2008-09 in the country, the cotton exports reached at US$ 850 million including 35 lakh bales. The Indian Cotton industry was worth approximately $38 billion, with growth of the industry heavily correlated with the rise and fall of cotton prices. However, exports of cotton have grown steadily throughout the last decade which reached $4.87 billion in 2006. Cotton Industry has numerous opportunities for entrepreneurs, Textile companies, fabric manufacturing companies that consume cotton raw material and supply various varieties of finished products and value added products are benefitted. Through various job agencies, there are various employment opportunities prevalent in India. The Indian Cotton Industry provides livelihood to farmers, and workers engaged in ginning, spinning, weaving, dyeing, designing and packaging, not leaving sewing and tailoring. In the year 2008-09 the yield gap between the world and India was narrowed down, as Indian yield was 5.5% to 591 kg per hectare. India still has miles to go before it can match yield levels in countries like Australia, China and the U.S. where yield is as high as 1840 kg, 1265 kg and 985 kg, respectively. The major achievement for Indian cotton has been a significant improvement in cotton yield in the last three to four years. The average national yield has almost doubled to 560 kilograms (kg) per hectare, climbing from around 300 kg per hectare as recently as 2002/03. Though the national yield level still compares poorly with the global average of 785 kg per hectare, world average yield grew by just 38% between 2000/01 and 2007/08. Conversely, India's average yield posted a whopping growth of 102% during the same period. Today Cotton crop contributes about 14 - 16% to the total agricultural-crop in India. India has the largest area under cotton with 9 million hectares in the world constituting 26% of total world cotton area. India presently produces 4.59 million tonnes of cotton with 27 million bales of 170 kgs each which constitutes 18% of the world cotton production. 60 million people including 4.5 million farmers in India depend on cotton production to earn their livelihood. 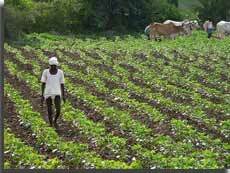 India Cotton Industry may boost the acreage to at least 10.5 million hectares. Farmers planted the crop across 10.4 million hectares and up 9 % from a year earlier, according to the farm ministry in the year 2009.